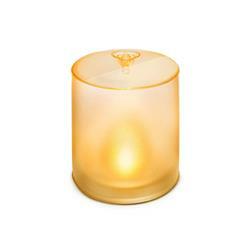 Turn your space into a soothing retreat with Luci Candle, our most inviting light. With a frosted finish, steady amber glow and comforting flameless flicker, Luci Candle adds a touch of zen to your patio, yoga studio or dinner table. Because it’s completely solar and lasts for hours, Luci gives you peace of mind where traditional candles can’t – no batteries needed. Safely enjoy the light’s warm radiance in the bath, bedroom or on a bookshelf, even around kids and pets. Flickers like a candle • frosted finish • charges in 8 hours • 10.2 cm height, 10.2 cm diameter, 3.2 cm collapsed • no batteries needed - just the sun.